No cable or other accessories. Latest software or drivers can be downloaded from DELL site. The controller is Brand New in Bulk Package, came as factory sealed, we only opened to test each and assure perfect working condition. 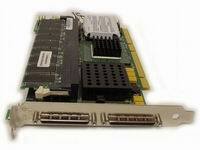 Dual-channel, low-profile Ultra320 SCSI RAID card for pedestal and rackmount servers. DELL OEM version of the Adaptec 2200S, Dual channel Ultra 320 RAID. The Adaptec SCSI RAID 2200S card is an affordable advanced-featured, microprocessor-based, Ultra320 SCSI RAID card in a low-profile form factor-making it ideal for mid-range and high-density servers and workstations. The card features a low-profile MD2 form factor, and accommodates an optionally available battery backup module (ABM-300) for 72-hour cache memory protection. All Adaptec low-profile RAID controllers have a full-size bracket installed on the card. The kits contain a low-profile bracket for use in 1U systems. 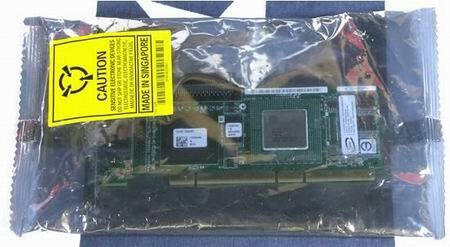 The PERC4/SC (PERC 4/SC) RAID controller is a high-performance, intelligent peripheral component interconnect (PCI)-to-small computer system interface (SCSI) host adapter with RAID control capabilities. It provides reliability, high performance, fault-tolerant disk subsystem management, and is an ideal RAID solution for internal storage in Dell's workgroup, departmental, and enterprise systems. The RAID controller offers a cost-effective way to implement RAID in a server. PERC4/SC (single channel) provides one SCSI channel. This RAID controller supports a low-voltage differential (LVD) SCSI bus.Using LVD, you can use cables up to 12 meters long. Throughput on each SCSI channel can be as high as 320 MB/sec. DELL P/N: C4372, J4588, 1U295. 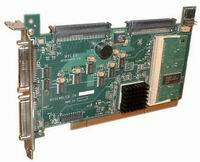 DELL PERC 4/DC (MegaRAID SCSI 320-2) Dual Ultra 320 SCSI RAID controller is a high-performance, intelligent peripheral component interconnect PCI-to-small computer system interface (SCSI) host adapter with RAID control capabilities. It provides reliability, high performance, fault-tolerant disk subsystem management, and is an ideal RAID solution for internal storage in Dell's workgroup, departmental, and enterprise systems. The RAID controller offers a cost-effective way to implement RAID in a server.